I surprised Diane with a visit a couple weeks ago. She had no clue so it was like a Christmas miracle, totally awesome. She happened to have my gift at the house, an ice cream maker attachment for my Kitchenaid. A week with my wife after not seeing her for four months AND the godlike power to make my own ice cream? You can keep the gold and incense. Here’s my first attempt at ice cream. The roasted cocoa gelato that was my first run with the machine made Talenti look like Dairy Queen, and you can make that using the same recipe but swapping the milk and cream quantities and replacing the whiskey with a cup of good Dutch cocoa you bake for an hour or so at 350 on a cookie sheet. And, y’know, leave out the cherries and chips. Whisk eggs and sugar together in a non stick skillet over medium low heat until smooth. 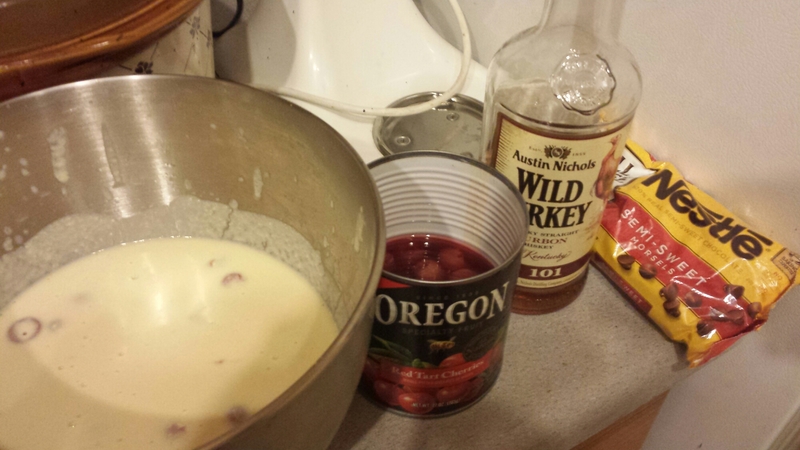 Increase heat to medium and gradually add cream, milk, strained cherries, and whiskey, whisking constantly. Remove from heat when frothy and alcohol is cooked out. Strain the mixture into a bowl, and notice that you have all the cherries in the strainer now, so throw those out and add new strained cherries, you dolt. Refrigerate until thoroughly chilled and pour into machine. When the ice cream begins to come together, add the chocolate chips.